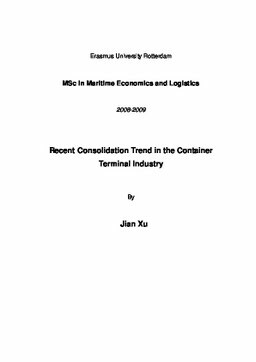 This thesis mainly focuses on the trend of consolidation in container terminal industry. Consolidation activities in container terminal industry have gathered pace during recent years. This thesis will first give a general introduction and analysis on the characteristics of the container terminal industry and then review the recent consolidation history in this field. The following chapters will illustrate reasons and impacts of the trend of consolidation, and then analyze the container terminal market and the whole maritime chain. Linear regression will be raised in order to underlie the internal factors behind the consolidation. After that several organizational options for consolidation will be shown, as well as a case study on DP world acquiring P&O Ports, which will help us to see how this activity occur in practice.